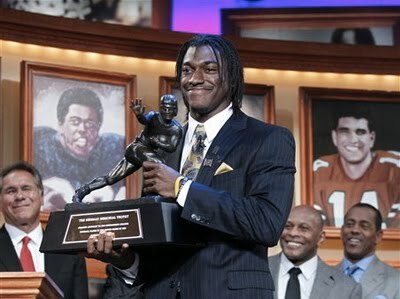 Baylor's quarterback, Robert Griffin III, walked away with the coveted Heisman trophy hardware last night. Griffin is the first in Baylor school history to win the Heisman. This also marks the first time two black quarterbacks have won the coveted college prize back to back (Auburn's Cam Newton won last year). It was Griffin that made Baylor, arguably a laughing joke when it came to college football, a contender. Griffin lead his team to their first ever nine game winning season by beating powerhouses such as Oklahoma and Texas. A dynamic threat with his arm and his legs, Griffin accounted for 45 touchdowns this season. He rushed for 100 or more yards twice and threw for 400 yards or more in four games this season. His 192.31 pass efficiency rating leads the nation and is on pace to break the N.C.A.A. single-season record of 186.0 set by Colt Brennan of Hawaii in 2006. But Griffin’s candidacy was more compelling than just his statistics. Griffin was born in Japan, where his parents, both Army sergeants, were stationed. He is also a dean’s list student at Baylor, having graduated last December with a degree in political science. He said he planned to apply to law school when he was done playing football.